Bob and Mark have performed some of the same procedures as the left side fork on the right side 49mm fork tube. The fork has been completely disassembled and cleaned. The OEM parts that will not be used have been accounted for and set aside. The fork tube has been reinstalled into the Performance Machine chrome lower slider with upper and lower bushings, washer/spacer, a new James seal, and retaining clip. We are now ready to install the Progressive Suspension monotube cartridge assembly into the fork tube. Carefully, secure the lower slider into the soft jawed vise. Install one factory dampner spring and one supplied dampner spring onto the bottom of the Progressive dampner assembly. 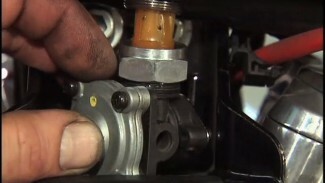 Like the, conventional, left side; the second spring is what is used to lower the front end one inch. Now, slide the entire assembly into the fork tube until it bottoms. The dampner bolt is prepped with a little blue Locktite and a new copper crush washer. Bob starts this bolt by hand and then torques to 30 – 37 foot pounds. 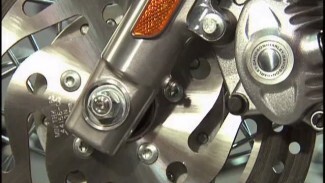 Like the left side assembly; if the lower dampner bolt can not be correctly tightened at this time, it can be final torqued after the assembly is completed. Now, the fork assembly needs to be installed into the fork tube holder. Have a second set of hands hold upward on the lower slider. This allows for enough room to fill the assembly with oil. Use a small funnel to fill the fork tube with 200cc, or 6.76 ounces of fork oil. 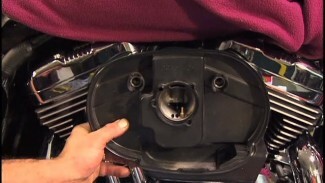 Push downward pressure on the assembly and tighten with the supplied socket from Progressive. Torque to 16-43 foot pounds, which is a spec from Progressive. 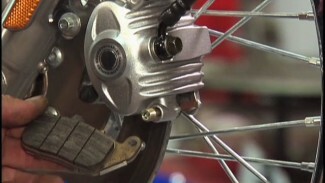 The left and right side fork assemblies are complete and ready to install back onto the motorcycle.